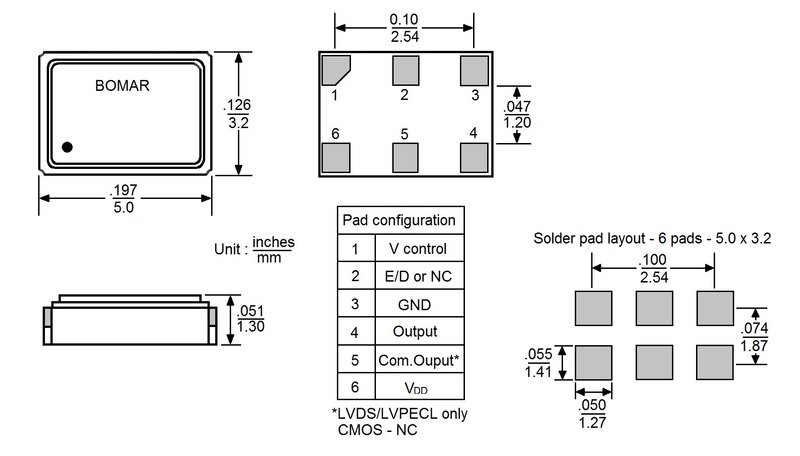 This smd vcxo series is a miniature ceramic surface mount vcxo with size of 5.0 x 3.2 x 1.3mm. Stability to ±10ppm and temperature to -40o to +85oC. Available CMOS, LVDS or LVPECL output logics. This smd vcxo is RoHS compliant. Temp ranges: to -40o to +85oC. Pull Range ±50ppm to ±150ppm min. Output rise and fall time (tr/tf) CMOS - 3nS max., LVDS & LVPECL - 0.6nS max. Output enable voltage 70% Vdd min. Output disable voltage 30% Vdd max. Phase Jitter RMS (12 KHz ~ 20MHz) 1.5pS max.